In 2016 Zhejiang Businessmen Conference, Jack Ma gave a speech on “How to grow your business in a challenging time?”. You will find many concepts taught by Sun Zi’s Art of War in his speech. 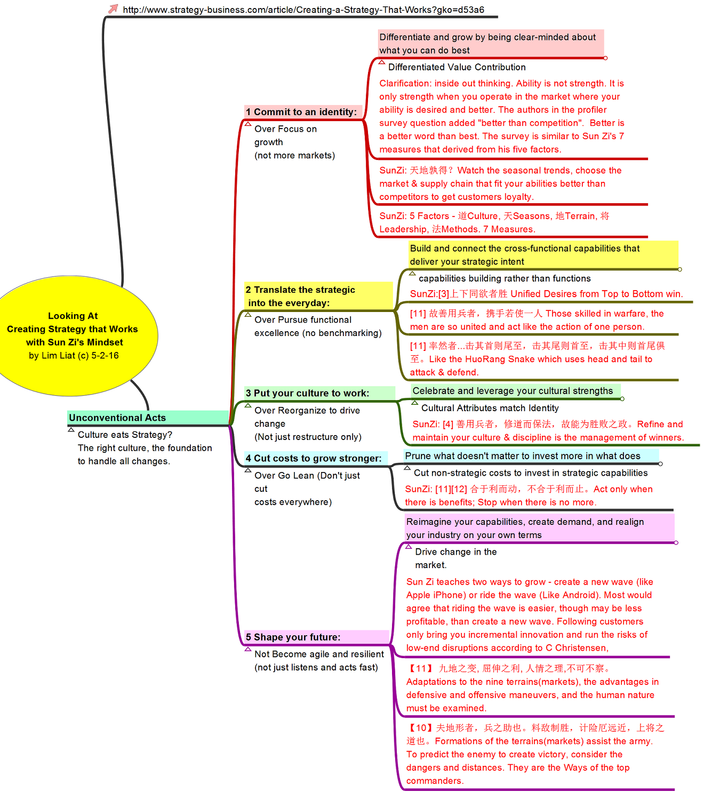 Here is his speech mind-mapped from the Art of War perspective. You can learn about the application of the Art of War by a very successful master. Jack Ma put forward 13 key points in his speech. I reorganized them according to Sun Zi’s Five factors. The most important concept is that any business must be constantly transforming itself to stay relevant to the market. This echoed Peter Drucker’s quote “Business failed because their theory of business does not match reality”. 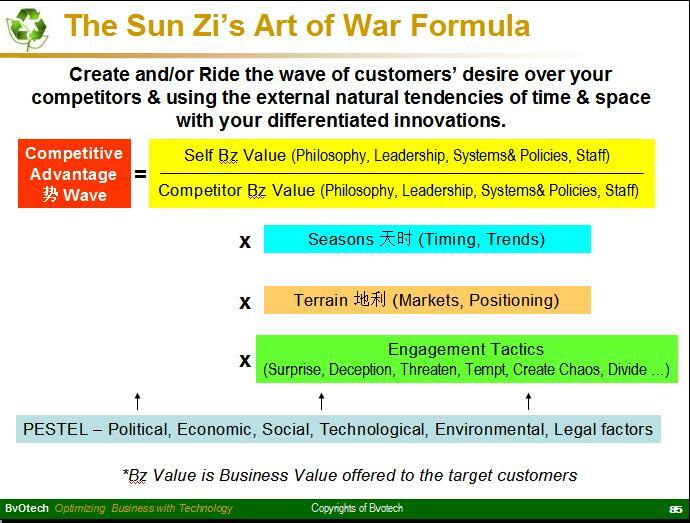 The main teaching of the Art of War is 审时度势 – Read the Time & Trends and then response rightly. Jack Ma said the inner strengths are about organization, talents, and culture. These are exactly the 法 method, 将 commanders/leadership, and 道 dao philosophy. The order is opposite of Sun Zi. But Jack Ma in other speeches said that Culture is key. So we see Jack did not have the order in mind. Sun Zi said that “Dao 道 is the thing that unites everyone from top to bottom to act together and they are not afraid to die and to live together. It is the mission, vision, and values of a business. It is the culture of the business. Jack Ma used a hunting story to show the difference. An entrepreneur and a manager went hunting. They fired at a wild-boar. They missed. The manager would run away. But the entrepreneur will bring out his knife to go after the wild-boar! When times turn bad, managers live first. Entrepreneurs will find ways to turn the business around. 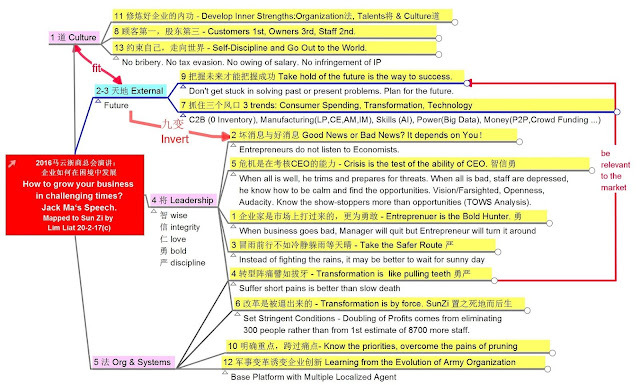 You can find the other leadership attributes highlighted by Sun Zi in Jack’s speech as shown on the map. Good News or Bad News? It all depends on You! If the economists forecast is bad, it may seem like bad news. But the good news is that it applies to everyone, including your competitors. Hence, another key principle of Sun Zi is about conversion. Choose the right combination of time, situations, people, methods such that you see the opportunities in the bad news, where also you convert the harms to benefits so that you can be successful while others fail. Similarly, when things are going well, you need the potential dangers, the current wastes, the possible redundancies in the future and take action now. 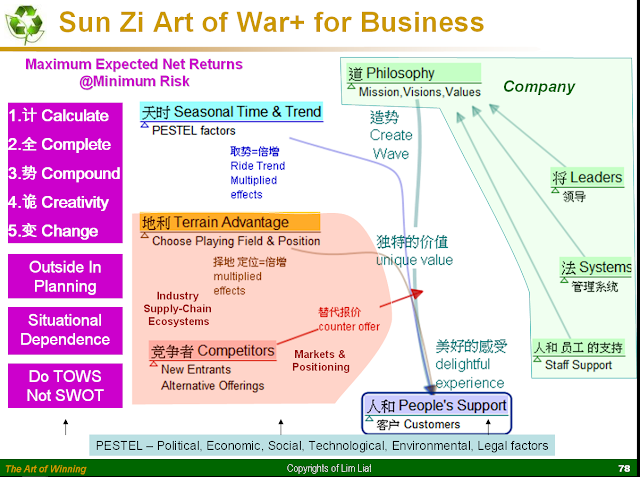 The Art of War is about cool and calm evidence base decision making based on facts and calculations. Warfare cannot be left to chance or by prayers. Threats must be addressed before opportunities. Jack Ma advised this in point 5 above. What are lessons can you pick up from Jack’s speech. What one or two things that impressed you that you may want to take action now to benefit your business?